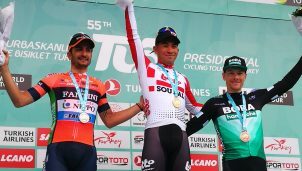 El kazajo Alexey Lutsenko ha ganado la segunda etapa del Tour de Omán. Una etapa con un terreno muy distinto al de la jornada de ayer, con una auténtica ratonera por final. Y de nuevo Euskadi-Murias se ha metido en la fuga buena del día para seguir teniendo presencia en una prueba a la que han sido invitados por primera vez. 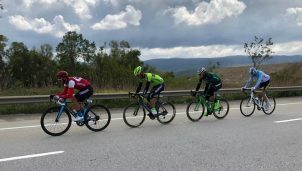 En esta ocasión por medio de Aritz Bagüés, que se ha metido junto a Jerome Baugnies y Preben Van Hecke. 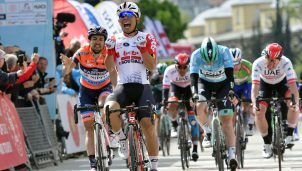 Lutsenko ha entrado en meta en solitario con unos metros de ventaja sobre Alexander Kristoff, el más rápido del pelotón, que sigue como líder de la carrera. 3 GIBBONS Ryan Team Dimension Data m.t. 4 FILOSI Iuri Delko Marseille Provence m.t. 5 NAESEN Oliver AG2R La Mondiale m.t. 6 COLBRELLI Sonny Bahrain Merida Pro Cycling Team m.t. 7 BATTAGLIN Enrico Team Katusha – Alpecin m.t. 8 DECLERCQ Benjamin Sport Vlaanderen – Baloise m.t. 9 VENTURINI Clément AG2R La Mondiale m.t. 10 CORT Magnus Astana Pro Team m.t. 11 BYSTRØM Sven Erik UAE-Team Emirates m.t. 12 PACHER Quentin Vital Concept – B&B Hotels m.t. 13 DEGAND Thomas Wanty – Groupe Gobert m.t. 14 WIŚNIOWSKI Łukasz CCC Team m.t. 15 VAN AVERMAET Greg CCC Team m.t. 16 HOULE Hugo Astana Pro Team m.t. 17 HANSEN Jesper Cofidis, Solutions Crédits m.t. 18 LIETAER Eliot Wallonie-Bruxelles m.t. 19 GESBERT Élie Team Arkéa Samsic m.t. 20 DE VOS Adam Rally UHC Cycling m.t. 21 DOUBEY Fabien Wanty – Groupe Gobert m.t. 22 COSTA Rui UAE-Team Emirates m.t. 23 DUIJN Huub Roompot – Charles m.t. 24 CRAS Steff Team Katusha – Alpecin m.t. 25 TERPSTRA Niki Direct Energie m.t. 26 FRANK Mathias AG2R La Mondiale m.t. 27 FABBRO Matteo Team Katusha – Alpecin m.t. 28 GRELLIER Fabien Direct Energie m.t. 29 O’CONNOR Ben Team Dimension Data m.t. 30 POLANC Jan UAE-Team Emirates m.t. 31 POZZOVIVO Domenico Bahrain Merida Pro Cycling Team m.t. 32 HERRADA Jesús Cofidis, Solutions Crédits m.t. 33 MCNULTY Brandon Rally UHC Cycling m.t. 34 SLAGTER Tom-Jelte Team Dimension Data m.t. 35 BOSWELL Ian Team Katusha – Alpecin m.t. 36 JANSE VAN RENSBURG Jacques Team Dimension Data m.t. 37 DILLIER Silvan AG2R La Mondiale m.t. 41 ATAPUMA Darwin Cofidis, Solutions Crédits m.t. 43 MORTIER Julien Wallonie-Bruxelles m.t. 44 NOVAK Domen Bahrain Merida Pro Cycling Team m.t. 45 SÁEZ Héctor Euskadi Basque Country – Murias m.t. 48 HOLLENSTEIN Reto Team Katusha – Alpecin m.t. 49 ASSELMAN Jesper Roompot – Charles m.t. 50 SCHÄR Michael CCC Team m.t. 51 BRITTON Rob Rally UHC Cycling m.t. 52 DE CLERCQ Bart Wanty – Groupe Gobert m.t. 53 MENTEN Milan Sport Vlaanderen – Baloise m.t. 54 MORENO Javier Delko Marseille Provence m.t. 55 NIBALI Antonio Bahrain Merida Pro Cycling Team m.t. 56 GREIPEL André Team Arkéa Samsic m.t. 57 PICHON Laurent Team Arkéa Samsic m.t. 58 REZA Kévin Vital Concept – B&B Hotels m.t. 59 MÜLLER Patrick Vital Concept – B&B Hotels m.t. 60 ARASHIRO Yukiya Bahrain Merida Pro Cycling Team m.t. 61 LAMMERTINK Maurits Roompot – Charles m.t. 62 ALLEGAERT Piet Sport Vlaanderen – Baloise m.t. 65 GIDICH Yevgeniy Astana Pro Team m.t. 69 GAUDIN Damien Direct Energie m.t. 70 LEMOINE Cyril Cofidis, Solutions Crédits m.t. 71 SOUPE Geoffrey Cofidis, Solutions Crédits m.t. 72 BIZHIGITOV Zhandos Astana Pro Team m.t. 73 DEHAES Kenny Wallonie-Bruxelles m.t. 74 PLANCKAERT Baptiste Wallonie-Bruxelles m.t. 75 VANDENBERGH Stijn AG2R La Mondiale m.t. 76 LEVEAU Jérémy Delko Marseille Provence m.t. 79 STEELS Stijn Roompot – Charles m.t. 81 VAN HOECKE Gijs CCC Team m.t. 82 VAN ROOY Kenneth Sport Vlaanderen – Baloise m.t. 83 GAROSIO Andrea Bahrain Merida Pro Cycling Team m.t. 86 MORICE Julien Vital Concept – B&B Hotels m.t. 88 VAN HOOYDONCK Nathan CCC Team m.t. 89 LIEPIŅŠ Emīls Wallonie-Bruxelles m.t. 90 GRADEK Kamil CCC Team m.t. 91 SPENGLER Lukas Wallonie-Bruxelles m.t. 92 COTÉ Pier-André Rally UHC Cycling m.t. 93 HUFFMAN Evan Rally UHC Cycling m.t. 94 DUVAL Julien AG2R La Mondiale m.t. 95 RUSSO Clément Team Arkéa Samsic m.t. 96 WAGNER Robert Team Arkéa Samsic m.t. 97 JARRIER Benoît Team Arkéa Samsic m.t. 98 CARDIS Romain Direct Energie m.t. 100 MARCATO Marco UAE-Team Emirates m.t. 101 VIEJO Jose Daniel Euskadi Basque Country – Murias m.t. 102 BONIFAZIO Niccolò Direct Energie m.t. 104 MURPHY John Rally UHC Cycling m.t. 105 BAGDONAS Gediminas AG2R La Mondiale m.t. 106 BAGÜES Aritz Euskadi Basque Country – Murias m.t. 107 RODRÍGUEZ Sergio Euskadi Basque Country – Murias m.t. 108 VENTER Jaco Team Dimension Data m.t. 109 NIZZOLO Giacomo Team Dimension Data m.t. 110 MIRZA Yousif UAE-Team Emirates m.t. 111 PETIT Adrien Direct Energie m.t. 115 BAUGNIES Jérôme Wanty – Groupe Gobert m.t. 117 GROSU Eduard Michael Delko Marseille Provence m.t. 118 VAN HECKE Preben Sport Vlaanderen – Baloise m.t. 120 VALLÉE Boris Wanty – Groupe Gobert m.t. 121 PLANCKAERT Emiel Sport Vlaanderen – Baloise m.t. 122 BOECKMANS Kris Vital Concept – B&B Hotels m.t. 124 DE DECKER Alfdan Wanty – Groupe Gobert m.t. 5 FILOSI Iuri Delko Marseille Provence m.t. 6 CORT Magnus Astana Pro Team m.t. 8 BYSTRØM Sven Erik UAE-Team Emirates m.t. 10 COSTA Rui UAE-Team Emirates m.t. 11 HANSEN Jesper Cofidis, Solutions Crédits m.t. 12 LIETAER Eliot Wallonie-Bruxelles m.t. 13 POLANC Jan UAE-Team Emirates m.t. 14 DE VOS Adam Rally UHC Cycling m.t. 15 BATTAGLIN Enrico Team Katusha – Alpecin m.t. 17 PACHER Quentin Vital Concept – B&B Hotels m.t. 18 JANSE VAN RENSBURG Jacques Team Dimension Data m.t. 20 DECLERCQ Benjamin Sport Vlaanderen – Baloise m.t. 21 O’CONNOR Ben Team Dimension Data m.t. 22 POZZOVIVO Domenico Bahrain Merida Pro Cycling Team m.t. 23 DOUBEY Fabien Wanty – Groupe Gobert m.t. 24 HERRADA Jesús Cofidis, Solutions Crédits m.t. 25 MCNULTY Brandon Rally UHC Cycling m.t. 26 NAESEN Oliver AG2R La Mondiale m.t. 27 DEGAND Thomas Wanty – Groupe Gobert m.t. 28 FRANK Mathias AG2R La Mondiale m.t. 29 CRAS Steff Team Katusha – Alpecin m.t. 30 WIŚNIOWSKI Łukasz CCC Team m.t. 31 DUIJN Huub Roompot – Charles m.t. 32 FABBRO Matteo Team Katusha – Alpecin m.t. 33 SLAGTER Tom-Jelte Team Dimension Data m.t. 34 BOSWELL Ian Team Katusha – Alpecin m.t. 39 ATAPUMA Darwin Cofidis, Solutions Crédits m.t. 41 SÁEZ Héctor Euskadi Basque Country – Murias m.t. 42 NOVAK Domen Bahrain Merida Pro Cycling Team m.t. 43 MINNAARD Marco Wanty – Groupe Gobert m.t. 49 GREIPEL André Team Arkéa Samsic m.t. 50 REZA Kévin Vital Concept – B&B Hotels m.t. 51 MENTEN Milan Sport Vlaanderen – Baloise m.t. 52 HOLLENSTEIN Reto Team Katusha – Alpecin m.t. 53 ARASHIRO Yukiya Bahrain Merida Pro Cycling Team m.t. 54 ASSELMAN Jesper Roompot – Charles m.t. 55 MÜLLER Patrick Vital Concept – B&B Hotels m.t. 56 BRITTON Rob Rally UHC Cycling m.t. 57 LAENGEN Vegard Stake UAE-Team Emirates m.t. 58 LAMMERTINK Maurits Roompot – Charles m.t. 59 ALLEGAERT Piet Sport Vlaanderen – Baloise m.t. 60 DE CLERCQ Bart Wanty – Groupe Gobert m.t. 61 MORENO Javier Delko Marseille Provence m.t. 69 DEHAES Kenny Wallonie-Bruxelles m.t. 71 LEVEAU Jérémy Delko Marseille Provence m.t. 72 PLANCKAERT Baptiste Wallonie-Bruxelles m.t. 73 BIZHIGITOV Zhandos Astana Pro Team m.t. 74 VANDENBERGH Stijn AG2R La Mondiale m.t. 79 BIERMANS Jenthe Team Katusha – Alpecin m.t. 88 VAN KEIRSBULCK Guillaume CCC Team m.t. 89 COTÉ Pier-André Rally UHC Cycling m.t. 90 CARDIS Romain Direct Energie m.t. 91 DUVAL Julien AG2R La Mondiale m.t. 92 VAN HOOYDONCK Nathan CCC Team m.t. 95 VIEJO Jose Daniel Euskadi Basque Country – Murias m.t. 96 LIGTHART Pim Direct Energie m.t. 105 MAGNER Ty Rally UHC Cycling m.t. 106 MURPHY John Rally UHC Cycling m.t. 107 MIRZA Yousif UAE-Team Emirates m.t. 108 BAGDONAS Gediminas AG2R La Mondiale m.t. 117 VAN HECKE Preben Sport Vlaanderen – Baloise m.t. 122 DE DECKER Alfdan Wanty – Groupe Gobert m.t.